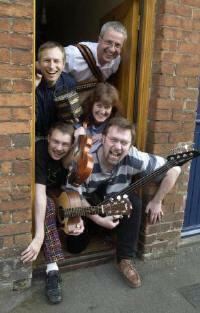 A very experienced barn dance and ceilidh band based in the Oxford area,with a flexible line-up, drawn from the membership of one of the top Festival ceilidh bands. The Festival 5 piece line-up (plus caller and sound engineer) is often too much for smaller local events where space for the band, time to set up, and,perhaps,money, are at a premium. So,with just three musicians plus caller, and a small, quickly assembled PA system,this ceilidh band could be the perfect choice for Weddings, PTAs, Scouts, Guides, Clubs, Birthday parties etc. etc. However,since this is designed to be a flexible band,the line-up may vary a bit in personnel, but never in style or standards! Thank you so much for entertaining us on Saturday night - everyone had a fantastic time and you guys were absolutely great. The surprise Ceilidh was an absolute hit with one and all - although we were suffering a bit the next day for stiff and sore legs!Do hope you all got home safely. We just wanted to thank you and the band for making our party so very enjoyable. The music was wonderful and the calling spot on. I know that everyone had a really good time so, thank you!